If you’re a ‘what you see is what you get,’ concrete, logical type, today’s post might be a challenge for you. Only the pig-headed and the naive know all there is to know about Life and Creation. Open up to learning, growing, and trust your center, not just Cartesian logic. Recently, Julie “Jewels” Bertrand (pictured above), a woman I met through my show on Hay House Radio, contacted me. She thanked me for the love and support she’s received from my work, and having heard about my mother’s illness, wanted to gift her an energy healing session. My usual response to offers like these is a grateful thank you. My life is very full, and unfortunately the internet isn’t always great at filtering out people with undesirable intentions. But, the authenticity of her writing and the warm feeling in my center made me think the experience could be positive. We arrived at Jewels marina-side home on a sparkling afternoon. My mom was excited to experience a new (to her) approach to well-being. I had my iPad tucked under my arm—figuring that while mom was receiving healing, I’d get some work done. At the door, smells of sweet-orange, frankincense, and lavender embraced us. Inside, candles, books, cascading fabrics, crystals, stones, and figurines swirled together to create a serene sanctuary that felt far removed from the city. Jewels greeted us, looking like a modern-day priestess. She’s healthy, fit, and fashionable. Formerly, an east coast executive, she now sports criss-crossed tan lines on her back. She fits perfectly into the southern California beach community—easy, calm, joyful, and relatable. Our meeting was effortless, no awkward, Hi-we-met-on-the-internet moments. Maya, Jewel’s scruffy Chihuahua, yapped and jumped at our feet—behaving true to her breed. My mom has never had an affinity for animals, and I wondered how the healing experience would be for her with a hyped up Chihuahua darting about. I saw a bed in the corner of the kitchen and hoped she’d be calm there, or if necessary, I—having won Animal Lover of the Year in 2nd grade—would have to forego my work and hold her. “Are you ready to work?” Jewels asked Maya as she rubbed essential oils her paws. Within minutes Maya became calm. She walked over to us and looked up at my mom and then at me. I smiled, knowing that she had just recognized my uber animal lover status, only to have her jump into my mother’s lap and lay her head against her heart. I wasn’t sure which aspect was more unusual: the dog knowing who needed healing, the dog NOT responding to my mojo, or my mother embracing Maya’s tiny body. Jewels explained the healing work she’d planned for my mom. She said that she’d received a healing meditation from a higher source—it came to her from Spirit in one sitting—and had brought profound peace and improvement to many of her clients. I’ve meditated since I was five years old, and I’ve created dozens of guided meditations. I know their creative, restorative, and relaxing powers. I decided to stay in the room for the session; I wanted to experience the meditation too. Jewels invited my mom to lay on her massage table. Maya barked and jumped upward as though trying to get onto it too. Jewels placed her on the back of my mom’s thighs, where she sat perfectly still for the next 90 minutes. The meditation was a seamless tapestry of chakra alignment, angels, essential oils, spirit guides, crystals, aura balancing, breath-work, reiki, prayer, and unconditional love. The bounds of space, time, and quantity of content, dissolved. Everything coalesced into a beautiful and effortless journey through healing realms. Soon, spontaneous tears surprised me, flowing fast and heavy down my cheeks. I felt immense light around me. At one point, I opened my eyes, and saw Jewels standing at my mother’s head holding energy that seemed to be the size of a beach ball, her skin glistening with moisture. She was beautifully radiant and completely immersed in her work. My deepest prayers—requests for spirit to speak to me in ways that I would recognize and understand, to remind me that I am never alone, always loved, always supported—were granted. I felt deep gratitude. As the session ended, Maya stood up, darted to the head of the table, licked my mom’s cheek once, and signaled to Jewels that she was ready to get down. Once on the floor, she celebrated by doing a lap around the room and bounding into my lap. Finally. She covered me in jubilant kisses. I’m convinced she’s a sage impersonating a dog. My mother sat up looking lovely and feeling energized and emotional. A plethora of symbols, scenes, and colors had come to her. She felt that her connection with life was strengthened and supported. She’d remembered painful feelings and long repressed wounds, and released them to Spirit. She’d also recalled long slumbering memories, times she felt a deeper knowing about life, and an ability to co-create with it, rather than run scared. With tears teetering on each word, she shared her deepest feelings and truths. Spiritual healing was evident. To close the session, Jewels gave my mom a bottle of a special brand of sweet-orange essential oil. She said it would help her to feel happier. I open that bottle every day, and it does bring an inspired lightness to my senses. Feeling overwhelmed by the generosity of Jewel’s heart, I attempted to pay for the now two hour session. She wouldn’t accept. She said this was a gift—a gesture of service—and she wanted to keep it this way. We gratefully accepted. My heart told me to leave her my own gift. I want her business to thrive so that as many people as possible can have this experience. I listened to my heart. If you’re in need of emotional, spiritual, or physical healing, consider love-based, energy medicine, in addition to conventional approaches to healing. It’s a profoundly beautiful and empowering experience. She also does distance healing. If you like this post, sign up for the Beautiful Life Newsletter, where I shared it first along with wisdom, personal sharing, and a free meditation—things I don’t publish here. Click below! It’s free. 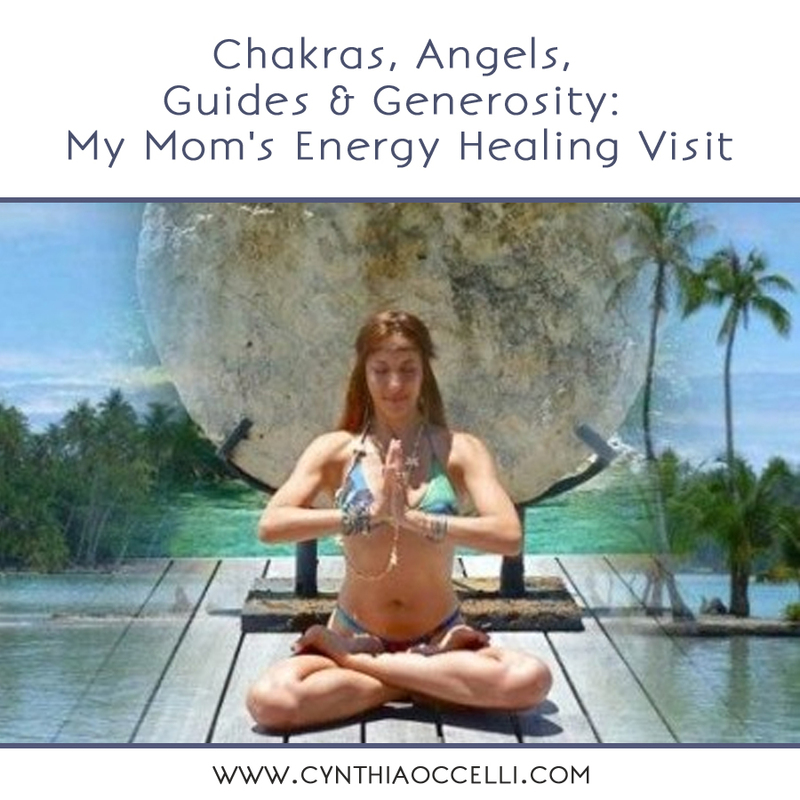 Cynthia, I am so honored that you wrote this beautiful post about the healing session with your dear mother. Honestly, I absolutely love your work. As you know I have been following you for over a year. I fell in love with your radio show, your blog and I Am Venus Facebook group. You have held me and given me inspiration at times of need, made me smile, encouraged me to believe in my gifts. When I heard the sound in your words you wrote when you mother fell ill, I knew I wanted to give back the love you give to all of us. I absolutely adore your mother. Her light is so bright. I certainly see where you get your light. I has been my honor to grace you mother with the light spirit has gifted me. Thank you fro the bottom of my heart for your kind words and I am ever grateful to serve you and your dear mother.